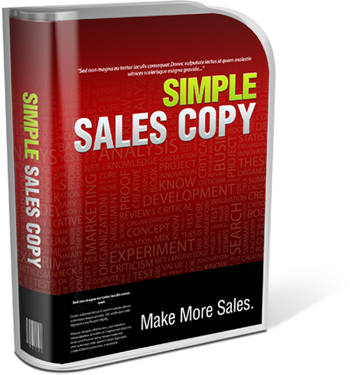 Simple Sales Copy allows you to generate all the top-notch sales copy you need to succeed online, quickly and easily, just by clicking and pointing. If you’re tired of trying to figure out how to write sales copy, or you don’t want to spend your hard-earned money on writer’s fees, this is the solution for you. This amazing program allows you to create captivating sales copy in just a few clicks of your mouse, you simply select the letter components you want to use and enter some basic information and the software program does the rest … instantly creating order-pulling, cash-producing sales copy you can start using immediately! Stop wasting your valuable time writing your own sales copy, or your valuable money on professional writers! Getting the TechDex Simple Sales Copy software program is your chance to get all the copy you need to send your sales soaring. Order Simple Sales Copy today and receive bonus training from professional sales copy writers on video and downloadable audio. Learn from the best copywriters for businesses, magazines and more. Learn how to write content that sells more products, recruit more members and make you more money! Click the button below and order right now.